In Florida, it's always wildfire season. But spring is the time of year when the risk is highest. For one thing, it's dry season. And Chelsea Ealum with The Florida Forest Service says that presents a lot of challenges. "Wildfire in Florida can be very tricky because we have a lot of places where homes are right up against wild lands or natural areas. But living in nature comes with inherent risk," Ealum said. And people are the number one cause of wildfires, she says. 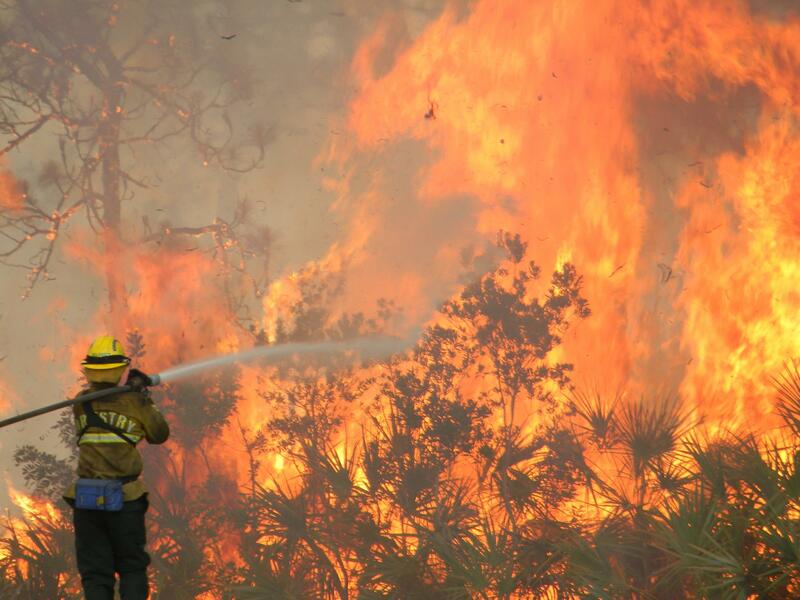 "Humans are by and large the number one cause of wildfires in the nation and in Florida. Last week, our number one cause was incendiary, which means intentionally set. Our second-most frequent cause was just unauthorized burn," Ealum said. More than 7,500 acres have burned in Collier County, cloaking neighborhoods and roadways in smoke. One resident there likened the atmosphere to something out of a science fiction movie. Crews from across the state have been fighting that fire, which has shut down a long stretch of Alligator Alley, the portion of Florida's Interstate 75 that runs from Naples to Fort Lauderdale. The Florida Highway Patrol is advising drivers to find alternatives to that main transit route across the Everglades. FHP monitoring I75 Alligator Alley! Driving can be especially hazardous in smoky conditions, which can alter visibility in seconds. That was the case in 2012 when a major chain-reaction crash on I-75 near Gainesville killed 11 people. Authorities say if you ever encounter smoke on the roads, slow down, but don't slam on brakes, turn on your low-beam headlights, and if you have to stop, pull all the way off the pavement and turn on your hazards. State Agriculture Commissioner Adam Putnam is advising Floridians to get the “FL Burn Tools” app, which helps you distinguish between wildfires and prescribed burns and determine whether you or your property are at risk. And Chelsea Ealum says even though Floridians know to prepare for hurricanes, they should also plan against wildfires—by preparing homes and being ready to go should an evacuation be called for. Dense smoke from a wildfire has affected air quality and visibility on the road from Miami to West Palm, the Bradenton Herald reports.